Walking around Aldgate, E1 it is easy to ignore the blatant and in this case quite literal signs of class and ethnic violence. Despite communicating a clear message, they fade into the background and hub bub of city life. It is only once you stop and stare that their message rings loud and clear ‘YOU DON’T BELONG HERE!’. Gentrification and the issues of class and ethnic cleansing are highly evident in Aldgate with the local struggle over space epitomised by two parks. Despite inhabiting practically the same location, less than a 5 minute walk from each other, they are miles apart economically and socially. At first glance there are some similarities, they both have grassy lawns, trees and seating arrangements with access controlled by fencing and a central single gate. However, this is where the similarities end. The ‘park’ just off Lehman street, a stones throw from Aldgate East tube station is possibly one of the best examples of how to alienate working class people from a space. I call it a ‘park’ as it is unclear whether it is even a public space to begin with! 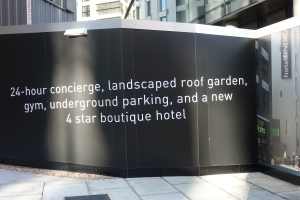 The first point of note is that the ‘park’ is hidden from the view of the street behind a development of luxury flats accessible through a courtyard on the former site of Goodman’s fields. Once filled with the horses that powered industry in the East End, residents of this new development enjoy fountains, a Pret a Manger (that well known staple of Gentrification), elegant statues of horses as well as a myriad of luxury marketing and estate agencies. A blatant exploitation of the areas working class history for capital gain and cultural kudos. This courtyard is penned in by high walls of glass and attractive brick, giving the sense of a hidden, enclosed or maybe even oppressive space. To the right of this courtyard was a passage way which leads to the ‘park’. Much like the Goodman’s Fields courtyard the ‘park’ is enclosed too, by the high white walls of luxury flats and to the front the shell of a new high rise development. This shell is shrouded by advertisements for the new Berkeley Homes. Slogans and images depicting a middle class paradise, featuring predominantly white, young and fashionable bodies, one woman carrying a LV handbag while shopping in the proposed Waitrose. The message is clear, this space is destined and designed for a certain kind of person. Alongside these images are messages about reinvigorating community, creating culture. This all facing a completely empty public space in which even the most persistent of communities would find it difficult to thrive. Not only is the ‘park’ shut in by bastions of gentrification claiming the space as for and only for the middle classes it is further shut away from the non-resident by a high grey fence and thick foliage. The gate at a first glance appears to be shut, with a distinct lack of signage on the outside to indicate access, most people walking past would have no idea it was even a park except for the gap in the bushes. When I visited the park a man, whose identity still remains unclear, overheard the group I was with debating whether we were allowed to enter or not. He told us it was ‘for the public’ and ‘open at this time’. This man who could have been a resident, a security guard or simply a passer-by acted as a literal as well as metaphorical gatekeeper. Giving us his approval to enter the ‘park’, had he not approached or deemed us fit we would have been completely excluded from this ‘public’ space. The distinct lack of signage indicates a sense of exclusivity, only those in the know, who live in the local area or have the right social capital can know of and therefore enter the space. It is deliberately hard to find and even harder to determine what it is and if you can enter. the space. It lists undesirable behaviours including ball games, drinking and talking loudly. The space is therefore clearly not designed for group enjoyment for people who drink, play ball games and who ‘talk loudly’ or shout. Beverley Skeggs (1997) suggests that the middle class imaginary of working classes has long coded them as excessive and lacking in control, whether it be bodily or behaviourally. By prohibiting behaviours associated with a lack of control and excess, such as drinking or simply talking too loudly the space is coded as controlled, imbedded with distinguishing middle class values of control, restriction and the ‘right’ behaviour. Of course, this not the case in reality, but ideologically the judgement of others and exclusion or inclusion of individuals from particularly spaces is premised on class judgements and values of behaviour. Educational studies have long argued that exclusion rates are higher in black working class boys because their behaviour is coded as excessive, uncontrolled and threatening. By listing undesirable behaviours the sign excludes individuals by classing the space but also provides a myriad of reasons for expulsion from the space if an undesirable individual dared to enter. A mere five minutes walk south from Goodman’s fields is the cable street park. This park presents a stark contrast to its neighbour. Approaching the park visitors are greeted by two things. Firstly, a sign, written in both English and Bangladeshi directing visitors to disabled toilets. This sign, unlike the advertisements opposite the ‘park’, act as a reminder of diverse bodies and cultures, instead of erasing and thus excluding them from the space. Despite its high black fence and gate, the park is visible from the street, there is a sign indicating the times when the park is open and closed. Unlike its neighbour it is clearly coded as a public space with signs directing individuals to its entrance rather than prohibiting their behaviour. The second signifier of diversity and inclusivity is the Cable Street Mural. Positioned directly next to the entrance of the park, the two storey high mural depicts the battle of cable street. A battle in which local residents in the 1930s fought both police and racist black shirt fascists, denying them access to protest in their neighbourhood. The mural, see below, depicts a moment of working class resistance against a fascist party, as well as the fascist state in which men and women battled to prevent individuals who sought to destroy their multicultural space from entering. The mural acts as a powerful visual reminder of the history of Cable street and Aldgate as a whole, as a space of revolution, racial mixing and the rise of anarchist and communist movements within the UK. It is a statement of local pride but also a strong statement against racism and the exclusion of diverse individuals from social spaces. In Goodman’s fields the ‘park’ all but erases the history of the space and in doing so erases the people who made that history. It creates both physical and symbolic barrier after barrier to exclude anyone who is not white, middle-class and able bodied, policed by residents and security guards while using signs but also a lack of signage to prevent the ‘general public’ from accessing that ‘public space’. It is symbolic violence at its most overt yet also its most hidden. 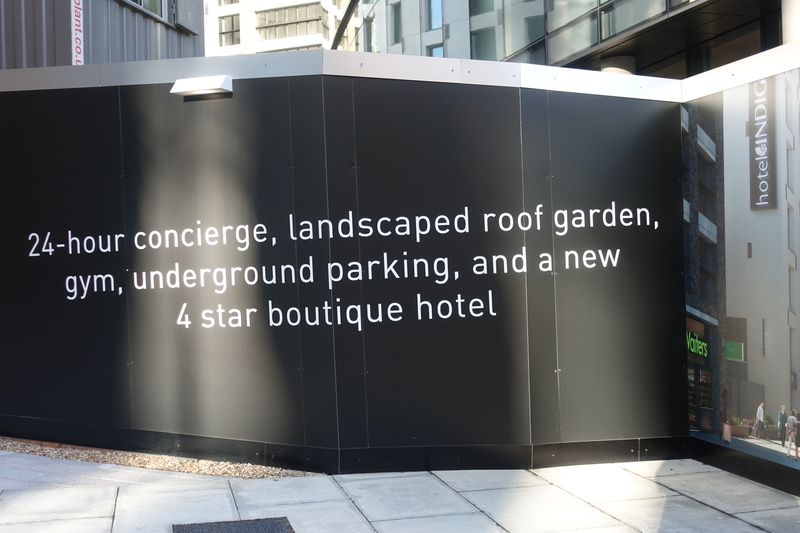 Depressingly Aldgate and its parks might be a sign of the times. As with demand for London property only set to increase, new developments much like Goodman’s fields are set to populate the South East of London; the public spaces and ‘community building’ whilst erasing existing working class bodies and working class history. One can only hope, much like the battle of cable street, this fascist cleansing can be halted in its tracks, barricaded out from neighbourhoods. The cable street park serves as an example of a truly public space, open to all communities, bodies and selves. The mural acting as a sign, excluding undesirable behaviours and bodies, much like the photos of the proposed Berkeley homes. However, these behaviours are the behaviours and bodies of the elite, those who seek to erase working class culture by through building on it and appropriating its cultural capital. It is a sign of resistance and resilience against a tide of Goodman’s fields’ and long may it remain so.